In the modern day, the local jeweler has come to MamaPapa’s house to show his spread before Mama and Uma, as he does every year. He makes the same joke he has made to her since she was born, saying, “Am I to make Baby’s wedding jewelry this year?” The joke still makes Uma blush, even though she is now middle-aged. Uma’s age is marked by many factors in the novel, and the jeweler must know that she is now past the typical marriageable age for her society. Still, he flatters her by pretending it is still possible for her to marry in their society. During Uma’s teenage years, all the female cousins in her family are nearing marrying age. Everyone’s favorite cousin, the gracious, beautiful and intelligent Anamika, wins a scholarship to Oxford, but her parents, Lila Aunty and Bakul Uncle, do not consider allowing her to go. Rather, to her private sadness, they stash her award off into a cabinet and bring it out only to show visitors. Anamika has many suitors, but her parents marry her off to a much older man because he “matches” her in degrees and prestige. The man pays no attention to Anamika, but rather appears to worship his own mother. Soon after their wedding, news floats to Uma’s family that Anamika’s husband and mother-in-law regularly beat her and that she is treated like a household servant. Soon, Anamika miscarries due to a beating, becoming infertile. Uma hopes that her husband will send her back home to her parents, but Anamika doesn’t return. Anamika holds all the female virtues valued by traditional Indian society—she is beautiful and accomplished, yet humble and obedient. But Anamika’s husband, chosen only for his status and not his character, cannot be pleased, and the abusive marriage destroys everything good in Anamika. Anamika enters into a marriage of prestige, and yet she becomes the most misfortunate character in the novel. The system of arranged marriage loses legitimacy in the case of Anamika. Her violent miscarriage is symbolic: Having no love for her, her husband destroys not only her spirit but her ability to have children—her potential to create life, to begin again. Ballinger-Dix, Elizabeth. 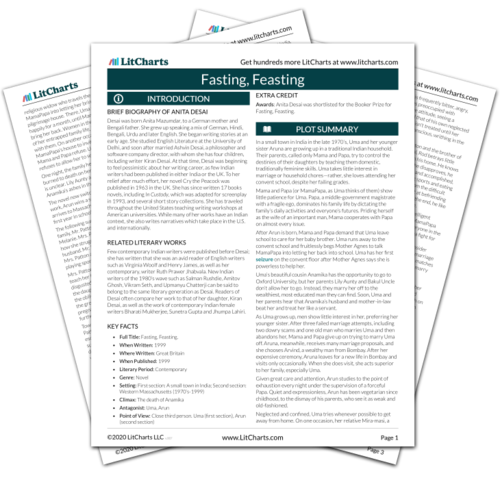 "Fasting, Feasting Chapter 6." LitCharts. LitCharts LLC, 7 Sep 2014. Web. 20 Apr 2019. Ballinger-Dix, Elizabeth. "Fasting, Feasting Chapter 6." LitCharts LLC, September 7, 2014. Retrieved April 20, 2019. https://www.litcharts.com/lit/fasting-feasting/chapter-6.